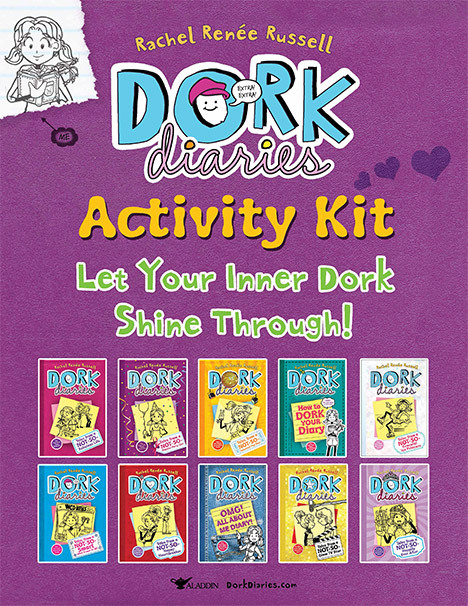 Inside this party kit, you’ll find suggested materials, activities, and games to make your event upbeat and lively — just the stuff to help everyone’s inner Dork shine through! Perfect for birthday parties, bookstore release parties and much more! This is so cool I love this I printed it out and now I can do it!! I am downloading this right now……..
HOPE YOU HAD A DORK-ALICIOUS BIRTHDAY NIKKI!!!! OMG! A party kit fo a party would be fab-u-lous! I suggested my dad uses this for my B-day so I LOOOOOOVE IT NIKKI! Cool!!!!!!! I get a cell phone when I am fourteen, so I get a cell phone at the same age you did! YAY!! Happy V day NIKKI ! !